InLoox PM 7 helps you make your project communication more efficient. The email templates allow you to insert pre-defined and project-based information into a new Outlook item. 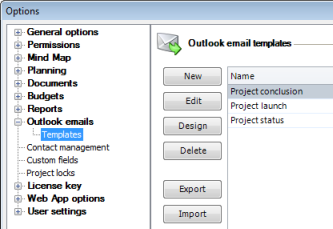 You can add custom email templates and modify the default templates in the InLoox PM 7 options. Under Outlook emails click Templates. On the right side you will see the Outlook email templates area. Define the Outlook email field rules such as Recipient, CC Recipient, BCC Recipient and Subject. Click the Arrow and choose from the drop-down list the field you want, e.g. <PROJECT_MANAGER_0>. Change the saved template by clicking Edit. In the Edit dialog box, you can make your changes (see the first point). How to customize email templates in InLoox PM 7 • Copyright 1999-2019 © InLoox, Inc. All rights reserved.